The 11th 'Chinese' Panchen Lama, Gyaltsen Norbu (known in pinyin as 'Bainqen Erdini Qoigyijabu'), is back in Lhasa, in winter this time. 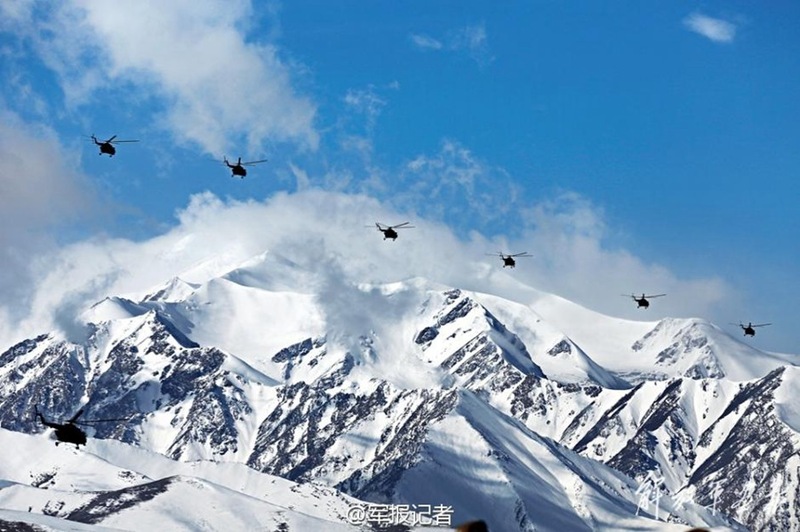 His arrival on the Roof of the World triggered a lot of media coverage in China. 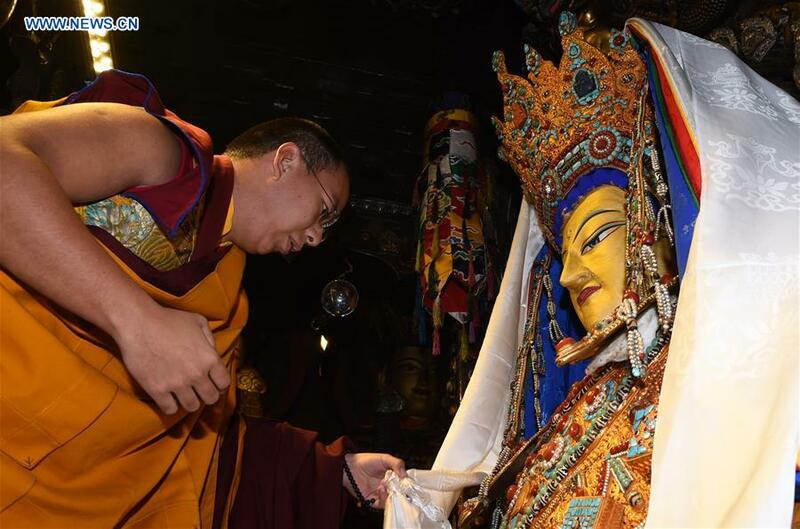 Xinhua also announced that the Beijing-selected Panchen Lama has been elected Chairman of Tibet Development Fund, an important 'non-governmental, non-profit organization', according to Xinhua. Of course, the Fund is a 'non-governmental' with Chinese characteristics, in other words, fully under the Party's control. The article quoted Gyaltsen Norbu saying that he will work hard to help develop Tibet and lift its people out of poverty. He was apparently elected to this new position during a meeting of the Fund's Directors, obviously with the blessings of Beijing. 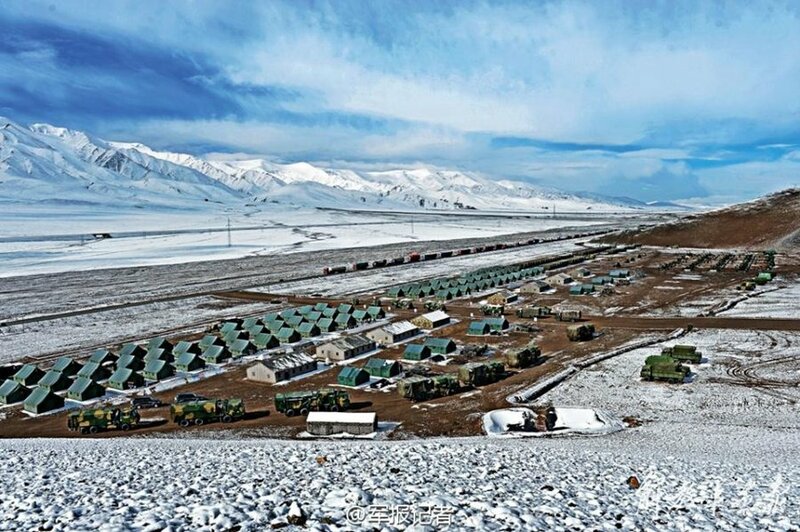 Xinhua noted: "The Tibet Development Fund, set up in 1987, has raised 106 million yuan (about 16.58 million U.S. dollars) for 387 projects in Tibet since 2006." Deng Xiaogang, executive vice chairman of the TAR's government and the powerful official responsible for Tibet's security, stated that "the fund is expected to play an even greater role in promoting social and economic development in Tibet under the leadership of the 11th Panchen Lama." Earlier, the 10th Panchen Lama and the famous Tibetan collaborator Ngabo Ngawang Jigme, had occupied the position. A few days before Gyaltsen Norbu's arrival in Lhasa, a series of articles appeared in the Chinese media. Gyaltsen Norbu also gave an interview, in Beijing, to China Tibet Online, a Xinhua affiliate. Norbu spoke about 'his' generation. He said "although he had a different growth environment from the majority of the post-90s, all of them live in an era of peace and happiness, a most harmonious, stable period with prosperous development, so the post-90s are rich in innovative and pioneering spirit, which should be promoted. The post-90s should make more efforts to contribute to the country." 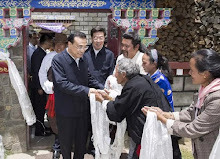 He also mentioned the importance of Buddhism: "To incorporate Tibetan Buddhism into socialist society, the most important thing is to let all those in the Tibetan Buddhist circle and the broad believers love the country, abide by law and adhere to disciplines. This is completely in conformity with the Tibetan Buddhism’s doctrines and also its correct development road." Did Buddha mention the "love of the country' in the sutras? The official media also carried 'relevant highlights' of Gyalsten Norbu's life (at least 2 photo features). 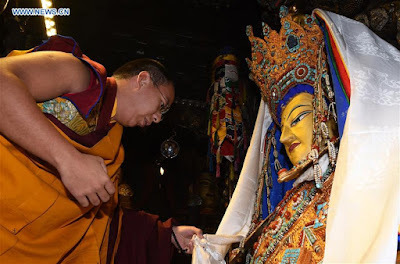 I have often written on this blog about the fake Golden Urn ritual through which he was selected as Panchen Lama in 1995. China Tibet Online gave its own explanation: "On November 29, 1995, a grand ceremony of drawing lot from the golden urn to determine the reincarnated soul boy of the 10th Panchen Lama was held before the statue of Sakyamuni in Jokhang Temple in Lhasa. 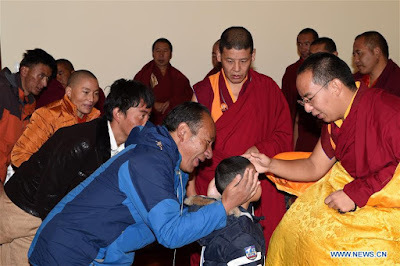 The five-year-old Gyaltsen Norbu was determined as the reincarnation of the 10th Panchen Lama. 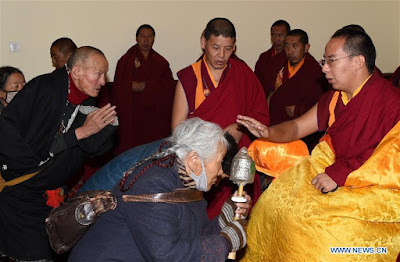 Upon the approval of the central government, he was formally enthroned at Tashilhunpo Monastery in Shigatse on December 8, 1995." This is obviously the Chinese version of the event. 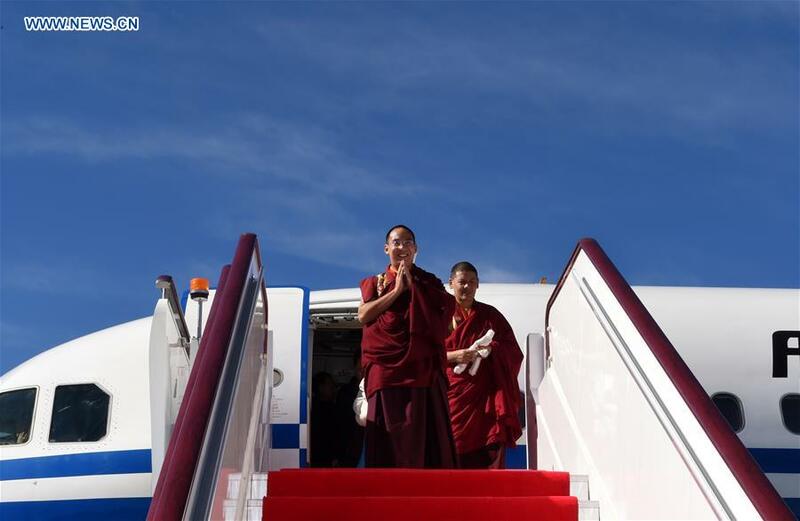 But it is also clear that, through this visit, Beijing is preparing for another 'reincarnation', the Dalai Lama's. (Let us not forget that the boy recognized by the Dalai Lama as the 11th Panchen Lama is still under house arrest somewhere in China). The Chinese media also recalled that on June 10, 2015, President Xi Jinping met the 11th Panchen Lama, "[a] member of the Standing Committee of the CPPCC National Committee and also vice president of the Buddhist Association of China. 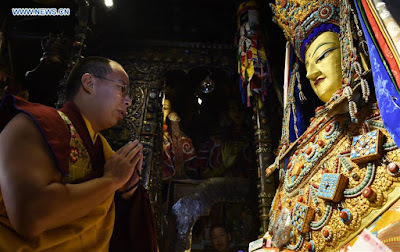 The Panchen Lama was also advised to advance his religious study, nurture his own virtue and expand his vision by obtaining more knowledge of modern science and culture." 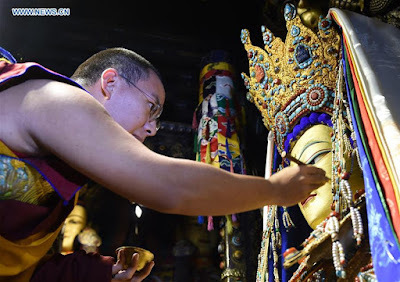 As he arrived in Lhasa, Gyaltsen Norbu made the customary visit to Jokhang cathedral where he worshiped a statue of the Buddha Sakyamuni and blessed the lamas present, said Xinhua, which added:"he arrived at the Temple around 5:30 a.m. and was greeted by lamas lined up at the temple gate. He paid homage to the statues of Buddhas". Xinhua especially mentions the status of Jowo, "Jokhang's house treasure -- a statue of Buddha Sakyamuni brought to the temple by Princess Wencheng of the Tang Dynasty in the seventh century." Gyaltsen Norbu is also said to have prayed for harvests, prosperity and stability. Please note 'stability'. Prayers are badly required? 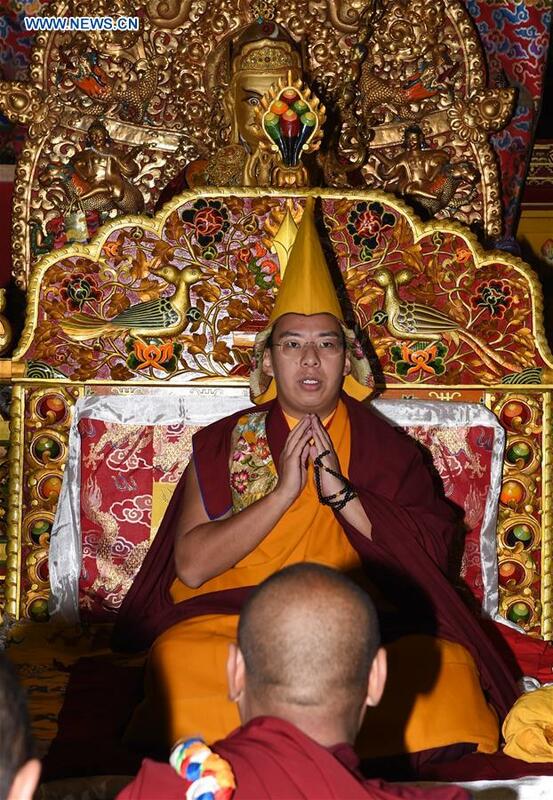 But it is clear that Beijing is preparing the post-Dalai Lama's era, by positioning their Panchen Lama as the one who will select the next Dalai Lama and assume some kind of 'regency' during the minority of the Dalai Lama. Hopefully, the future will not work according to Beijing's plans, but planning is going on full swing. 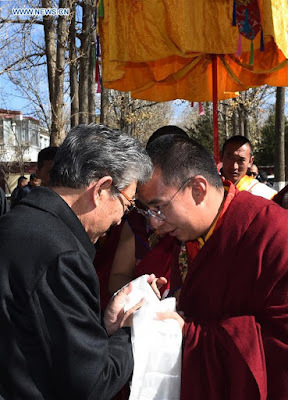 Here are some photos of the arrival of Gyalsten Norbu in Lhasa. What is ‘terror’ for China? China does not seem to have the same definition of the word ‘terrorism’ than India and the rest of the world. 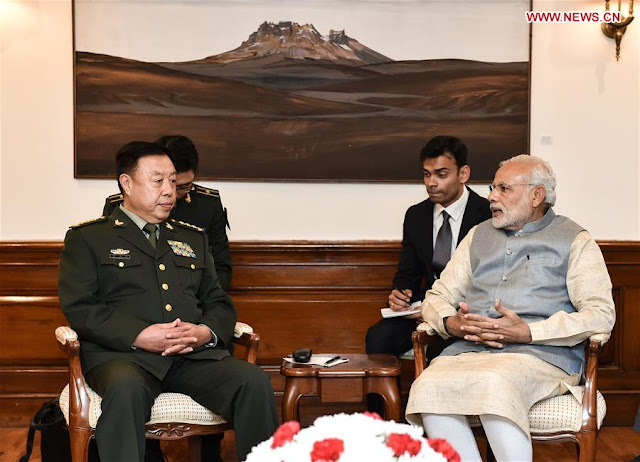 It was obvious when a 26-member delegation of the People’s Liberation Army (PLA) headed by General Fan Changlong, Vice-Chairman of China's powerful Central Military Commission (CMC) recently visited New Delhi. 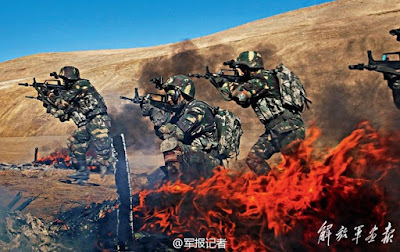 After meeting Manohar Parrikar, India’s Defence Minister, Rear Admiral Guan Youfei, Director General, Foreign Affairs Office in China's Ministry of National Defence broke a surprising piece of news to the Indian Press: “Pakistan is also a victim of terrorism. In the past few years, Pakistan has been fighting terrorism with a lot of casualties,” he affirmed. Had the visit of General Fan’s delegation to Pakistan earlier in the week influenced this Chinese perception? Rear Admiral Guan also asserted that Pakistan has in the recent “past started a military operation to fight terrorism with positive achievements.” Was the Admiral speaking seriously? 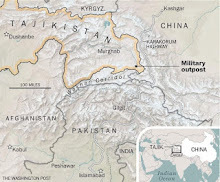 When asked by a journalist, how China’s 'all-weather friend' could be a ‘victim’ when it harbours and uses terrorists itself, Guan answered, "China will continue to support Pakistan's efforts in fighting terrorism, especially in fighting the Eastern Turkistan Islamic Movement." Why mention only this nebulous Uyghur group, which, according to Beijing, has been involved in terrorist acts in Xinjiang? The Admiral expounded on Beijing’s position on terrorism: “There should not be any double standards,” he affirmed. He was referring to the United States, which, according to Beijing has been ‘interfering’ in the South China Sea region: "The South China Sea in essence is a dispute caused by different understanding and perception on the islands and reefs in the South China Sea," he asserted. He added that in case of a dispute, “China always stands for negotiations directly between states in the South China Sea region. China does not agree with the interference of countries outside the region in this issue." Guan also said that China wants to work towards deepening counterterrorism cooperation with India. But for this, one needs to have the same definition of ‘terrorism’. 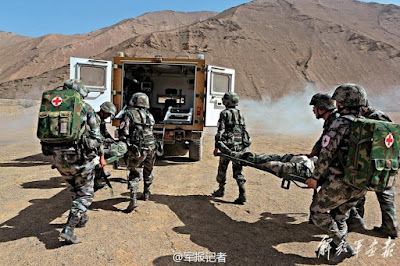 China’s clean sheet to Pakistan comes after November 13, the Dark Friday when Paris witnessed the worst terror attack in France's history: some 132 people were killed and more than 350 injured. It was only 3 days later that Abdelhamid Abaaoud, the mastermind of the attack in Paris, was killed during a seven-hour raid conducted by French police commandos on a flat in Saint Denis suburb near Paris. The French police action ended in bloodshed with the death of the 27-year-old Belgian IS militant and the surrender of 7 terrorists. Paris Prosecutor François Molins also confirmed that the woman who blew herself up with a suicide vest during the raid (damaging the building's structural integrity) was Abaaoud's cousin. The situation was so bad that the French Parliament agreed (nearly unanimously) to a 3-month state of emergency, giving greater powers to the police to deal with the threat. How can China give a certificate of good conduct to Pakistan, the terrorist state par excellence, when such tragic events have just occurred? It also cites British Prime Minister Gordon Brown, Foreign Secretary David Milliband, German Chancellor Angela Merkel and French President Sarkozy, ‘the most heartless’ according to Beijing; he had dared to speak about the boycott of the Beijing Olympics opening ceremony. It is clear that the definition of ‘terrorism’ is not the same in Paris and in Beijing. It was so in 2008, it remains so today. Can Tibet’s situation be associated with the IS’s barbaric actions? 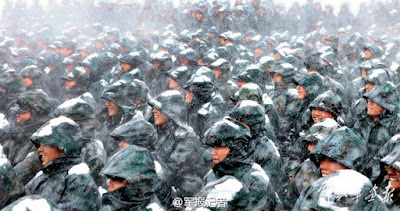 Beijing forgets that Tibet was a peaceful independent country when the PLA marched into Eastern Tibet in October 1950. Mao’s objective was to ‘liberate’ the Tibetans, but when the latter didn’t agree to be 'liberated', China used brutal force. 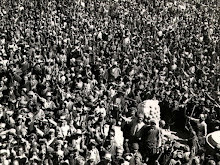 During the uprising in Lhasa in March 1959, according to Chinese figures, 87,000 Tibetans were killed in a couple of weeks. Are Tibetans ‘terrorists’ for resisting their own 'liberation'? The Chinese President was attending the APEC Meet which, as a rare gesture, called for more solidarity to combat global terror: “Under the shadow cast by the terrorist attacks in Paris, Beirut, and against Russian aircraft over the Sinai, and elsewhere, we strongly condemn all acts, methods, and practices of terrorism in all their forms and manifestations,” the joint declaration said. But how can China mix up real terrorist acts like in Paris (or elsewhere) with the aspiration of the Tibetan people for more freedom? For Beijing, apart from the ideological confusion about the term ‘terror’, the issue is rather complicated due to its policy of ‘mutual respect for each other's territorial integrity and sovereignty,’ born out of the Panchsheel doctrine. In any case, Beijing needs to do some homework and clarify to the world what it considers as ‘terrorism’. 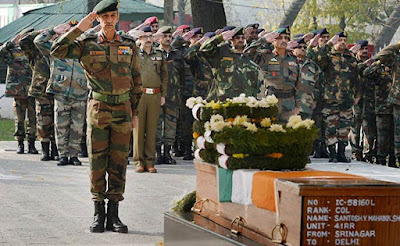 At the time of Admiral Guan’s statement, Colonel Santosh Mahadik was killed in a gun battle with militants in Kupwara district of Jammu and Kashmir. The 38-year-old Mahadik is the second Commanding Officer (CO) to die in a terrorist encounter this year. Col Mahadik, who belonged to the 41 Rashtriya Rifles was chasing heavily-armed terrorists, who had infiltrated across the LoC. Can China still say that Pakistan is the victim? Something special happened in China on Friday. President Xi Jinping honoured the memoir of Hu Yaobang,the liberal Communist Party boss whose death in April 1989, triggered widespread mourning in China, and culminated in the Tiananmen pro-democracy movement a few weeks later. On Friday, China celebrated the birth centenary of the reformist leader with an official function attended by Xi Jinping and his 6 colleagues of the Standing Committee of the Politburo. According to Xinhua, Xi Jinping stated: "To commemorate Hu Yaobang is to learn from his noble character, which was based on keeping the faith and being dedicated." Xi asked all Chinese Communists "to have similar firm faith and ideals, and be more confident in Chinese socialist roads, theories and systems." The Chinese President added that one should learn from Hu's spirit to always seek truth from facts and to blaze new trails. Hu always stressed that Communists must 'seek truths from facts'; it is the basic requirement, and attempts to abandon this will result in setbacks, Xi said. The President called for a clean political environment, social ethics, and asked the Party members "to win the trust and support of the general public with down-to-earth efforts." It is the first time that China honours Hu in such way since 1989. The South China Morning Post quoting an unidentified source, said: “The atmosphere at the ceremony held at Beijing’s Great Hall of the People was very, very moving." The function was not reported in advance by the State media, though, The People’s Daily had earlier mentioned the publication of a collection of 77 of Hu’s essays and speeches between 1952 and 1986 – a year before he was purged. One of the documents is an order passed by Hu to vindicate the people wrongly accused in the Cultural Revolution (1966-76). Hu Yaobang died on April 15, 1989, from a heart attack. Hundreds of thousands turned out on the streets of Beijing to pay their homage to the reformist leader. This event marked the beginning of the Tiananmen pro-democracy movement, which ended in the June 4 crackdown. The liberal leader visited Lhasa in Tibet in May 1980. I am posting here a report by Wang Yao who accompanied Hu in Lhasa. During a speech, Hu told the Party cadres that the Tibetans should "exercise nationality autonomy in the region fully - that is to say, to let Tibetans really be the masters of their own lives." This is not far from the 'genuine autonomy' asked by the Dalai Lama today. 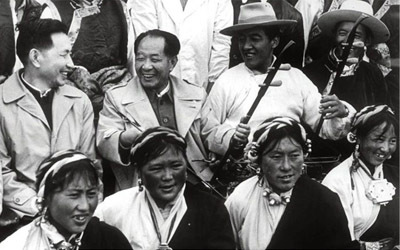 During the week from May 22 to May 31, 1980, Hu Yaobang led a Working Group of the Party Central Committee (PCC) to visit and inspect Tibet. This event was watched with great interest by those, both at home and abroad, who were concerned with Tibetan society, and it can be said that this event marked the beginning of a new era for the PCC's Tibet policy. In the ten years that followed that visit history marched on with its strong steps, leaving behind impressive footprints: amongst them, indisputably, the open door, a revitalised economy, changes in the social structure and an improvement in people's lives. 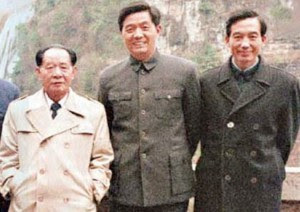 As for Hu Yaobang himself, he experienced his ups and downs with officialdom and left the world with his ambitions unfulfilled on April 15, 1989. The great honours that were paid to him at his funeral could not make up for the regrets during his life. But the past has passed. According to Chinese custom, final judgement can only be passed on Hu when the lid is placed on his coffin, and this note is a reflection on the historical significance of Hu's visit to Tibet, as a mark of respect to him and as a way of cherishing the memory of a great man. The Composition and Timing of the Working Group The importance of the Central Committee's Working Group can be judged from Wan Li's description of it: 'This is the first working group to be formed since Comrade Hu Yaobang became the General Secretary after the new secretariat was formed at the Fifth Plenary Session of the Eleventh Central Committee.' The Working Group was composed principally of five people: Hu Yaobang, the General Secretary of the Central Committee and a member of the Standing Committee of the Politburo of the Central Committee; Wan Li, member of the Central Committee and Vice-Premier of the State Council; Ahpeiahwangjinmei [Ngapo Ngawang Jigme], the Vice-Chairman of the National People's Congress; Yang Jingren, member of the Central Committee and the Head of the State Commission of Nationalities Affairs, and Zhao Zhengqing, Vice-Minister of the Organisation Department of the PCC. This was true of the date chosen for the visit, and there were at least three reasons which led the Working Group to select May 22 as the date when it should arrive in Lhasa. 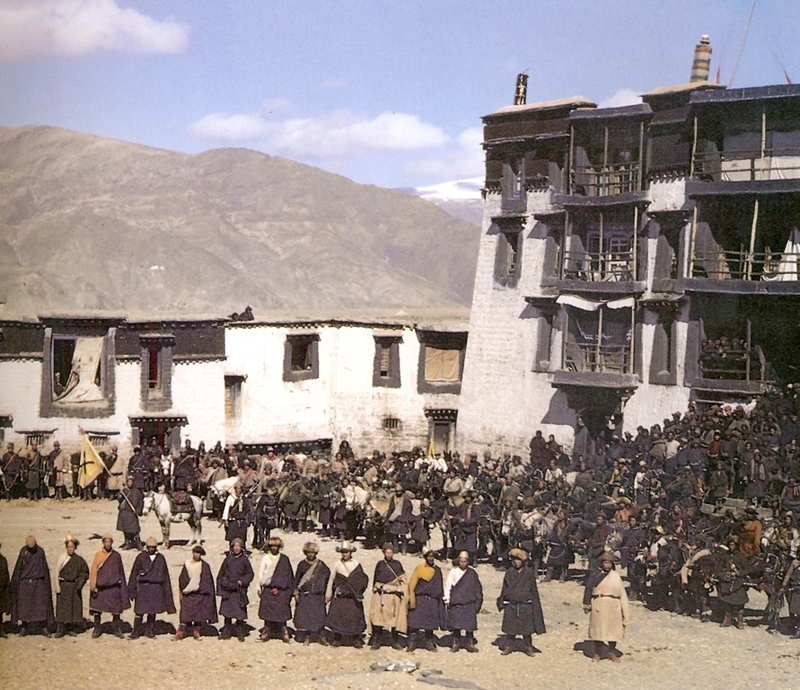 First, the date indicated that the Central Government's policy on Tibet was based on the 'Seventeen-Point Agreement'. This was the agreement (entitled in full, 'Seventeen Points for the Peaceful Liberation of Tibet') signed in the Qinzheng Hall in Zhongnanhai, Beijing, on May 23, 1951, after a long period of discussion and consultation, by the delegation of the Central People's Government, headed by its plenipotentiary Li Weihan, and the delegation of the Tibetan Regional Government, headed by plenipotentiary Ahpeiahwangjinmei. That agreement marked the first time since its victory in the domestic revolution that the Chinese Communist Party had found a point of convergence with the Tibetan regional government; it was also the first agreement, based on compromise and harmony, which was acceptable to all the political forces in Tibet. It thus became the governing principle in Tibetan work and policy for a long period. Secondly, the choice of date pointed out that the Central Government was willing to settle matters through consultation with the local people. 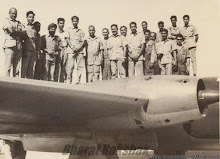 Thirdly, it aimed to show the Central Government's wish to restore the harmonious atmosphere of cooperation which had prevailed in the early 1950s. 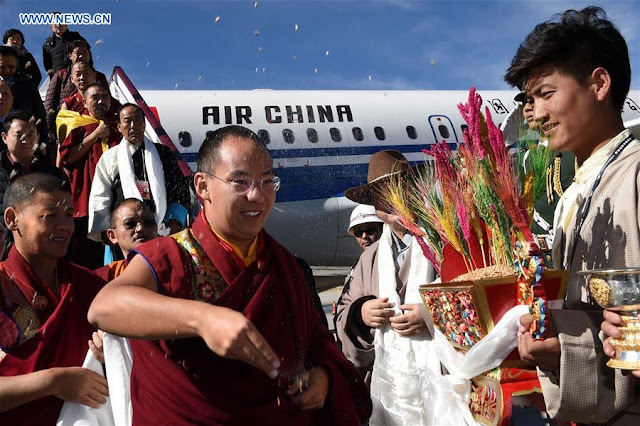 The Working Group arrived at Gong Ga [Gongkar] airport near Lhasa at 10 a.m. on May 22, and two hours later had reached Lhasa and begun its meetings with the Tibetan leaders. Hu Yaobang came straight to the point by asking Paba-la [Phagpala Gelek Namgyal] a question:”Comrade Paba-la, what is tomorrow?” This summed up the feelings and intentions of the Group. At the cocktail party held on May 23 to celebrate the 39th anniversary of the Seventeen-Point Agreement, Wan Li held the hands of Sangpodunzhengdunzhu [Sampho Tenzin Dundrup] and said: 'You have rendered an outstanding service to history! Thank you!' Apart from Ahpeiahwangjinmei, Sangpodunzhengdunzhu was the only surviving member of the delegation sent by the Tibetan government who had signed the Agreement. He had just been released after nearly twenty years in labour camps. On May 29 Hu Yaobang made a very sincere and passionate political speech at a gathering of 5,000 cadres in Lhasa. The slogan put forward in the speech was 'Strive to build a united, prosperous and civilised new Tibet' ('Wei jianshe tuanjie fuyu wenmingde, xin Xizang xiang nuli douzheng'). To exercise nationality autonomy in the region fully - that is to say, to let Tibetans really be the masters of their own lives. A commitment by the Central Government to relieve and reduce burdens of the people, exempting the from agricultural and animal husbandry tax over the next three to five years in order to allow the Tibetan people a chance to recover. To adopt a special policy to revive the Tibetan economy, including the adoption or a system of private economy in line with Tibetan circumstances. Nationwide this initiative was developed into the economic (household) responsibility system. To make great efforts to develop agriculture and animal husbandry as well as the manufacture of consumer goods, in order to promote economic prosperity and enrich people's lives. To make efforts to develop Tibetan science, culture and education, and to prepare for the establishing of the University of Tibet. 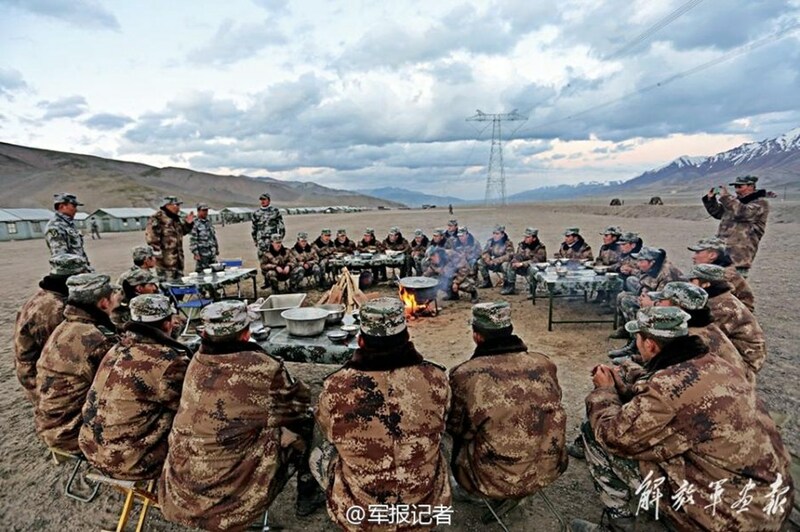 To implement the policy on minority nationality cadres correctly, to strengthen the unity between the Han and Tibetan cadres, and to transfer a large quantity of Chinese cadres who had worked in Tibet for many years back to the interior. What he said touched people's hearts. They admired him for his statesmanship and his broad-mindedness as a true Communist. It was open and honest, dared to act, dared to face reality and dared to bear responsibility. Ten years later Hu Yaobang's words still ring out forcefully. To this day, the Tibetan people still keep his likeness in their hearts, referring to him affectionately as 'sku-zhabs Hu' [Gentleman Hu]. These three men were later appointed to important Positions. 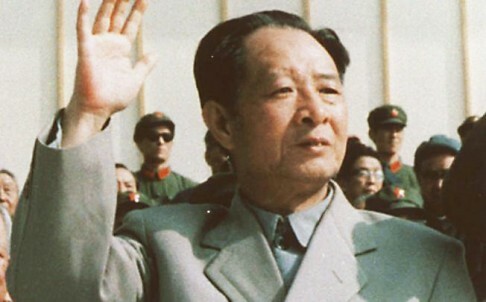 Duojicaidan became Director of the TAR Department of Education, First Secretary of the Lhasa Party Committee, and Chairman of the TAR People's Government. Now he is the Director of the China Tibetology Center in Beijing. Luosangsicheng was appointed as the Director of the TAR Party Committee's Department of Organisation, and as the vice-Chairman of the Standing Committee of the Tibetan People's Congress. Unfortunately, he died of a heart attack shortly afterwards. Pengcuozhaxi became at various times in his career the Director of Publications for the Tibetan Administration, the vice-Chairman of the Tibetan People's Congress and the vice-Chairman of the Social Science Academy. Now he is the vice-Director of the China Tibetology Center. In the second of the Two Cordial Conversations, Ru invited two leading figures of the Old Tibet to talk with him. Xuekangtudengnima [Sholkhang Thubten Nyima] and Qiabagesangwangdui [Chapei Kelsang Wangdu] were old acquaintances of Ru, who as members of the Chinese Youth Delegation had been to visit Moscow and Bucharest with him in the 1950s. Ru did not forget his old friends although thirty years had passed. Hu held their hands and chatted delightedly. He looked back over their past friendship and hoped that they would guide the patriotic leading figures of the old Tibet to strive together to construct a new Tibet. Before long, Xuekangtudcngnima [Sholkhang] was appointed as the vice-Director of the Tibetan Cultural Department and the vice-Chairman of the People's Political Consultative Conference of the TAR, and Qiabagesangwangdui later became the Director of the People's Bank of the TAR. A 26-member delegation of the People’s Liberation Army (PLA) headed by General Fan Changlong, Vice-Chairman of China's powerful Central Military Commission (CMC) visited in New Delhi this week. After the delegation met Manohar Parrikar, the Indian Defence Minister, Rear Admiral Guan Youfei, Director General, Foreign Affairs Office in China's Ministry of National Defence gave a surprising piece of news to the Indian Press: “Pakistan is also a victim of terrorism. In the past few years, Pakistan has been fighting terrorism with a lot of casualties,” he affirmed. Was the Admiral speaking seriously? When asked how China’s 'all-weather friend' can be a ‘victim’ when it harbours and uses terrorists, Guan answered, "China will continue to support Pakistan's efforts in fighting terrorism, especially in fighting the Eastern Turkistan Islamic Movement." Why to mention only this nebulous Uyghur group which, according to Beijing, has been involved in terrorist acts in Xinjiang? “There should not be any double standards,” said the Admiral. 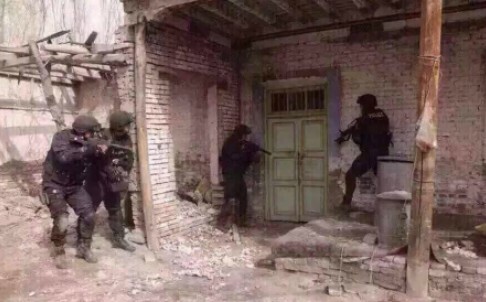 This is China’s position on terrorism. He was probably referring to the United States, which, according to Beijing has been ‘interfering’ in the South China Sea region: "The South China Sea in essence is a dispute caused by different understanding and perception on the islands and reefs in the South China Sea," he said. He added that when there is a dispute, “China always stands for negotiations directly between states in the South China Sea region. China does not agree with the interference of countries outside the region in this issue." 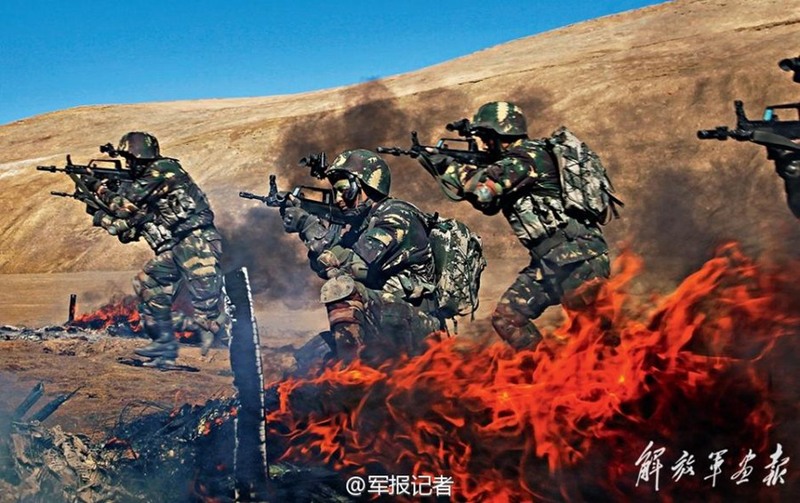 Guan also asserted that as China opposes terrorism in any form, his country will work towards deepening counterterrorism cooperation with India. The words of Admiral Guan sound weird a few days after Paris witnessed the worst terror attack in France's history: some 129 people were killed and more than 350 injured. How can China give a certificate of good conduct to Pakistan, the terrorist state par excellence? 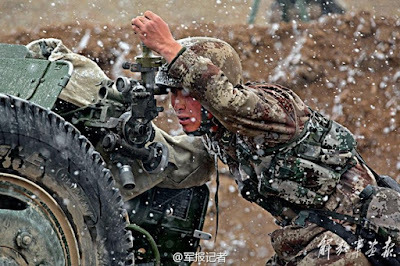 To understand Beijing’s mindset, one should read an article which appeared in the China Tibet Online. It is entitled: “Ugliness of western politicians in contrast to Xi Jinping’s message of condolence”. 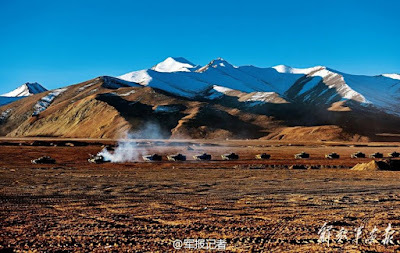 The article also mentions the reaction of Italian Foreign Minister Massimo D’Alema and the Swedish Foreign Minister Carl Bildt who condemned repression and urged the Chinese authorities to "fully respect human rights in Tibet". And the most heartless for Beijing was President Sarkozy who dared speaking about the boycott of the Beijing Olympics opening ceremony. It is clear that the definition of ‘terrorism’ is not the same in Paris and in Beijing. It was so in 2008, it remains so today. Beijing just forgets that Tibet was a peaceful independent country when the PLA walked into Eastern Tibet in October 1950. Their objective was to ‘liberate’ the Tibetans, when they did not agree to be 'liberated', force was used by Beijing. They have become ‘terrorists’ for resisting their own 'liberation'. Speaking of 'terrorism' in the case of the Tibetans, will not solve the issue. It however shows that there is long long way to go to find a common ground to define 'terrorism' amongst nations, especially with authoritarian states such as China. In the meantime, Colonel Santosh Mahadik was killed in a gun battle with militants in Kupwara district of Jammu and Kashmir. The 38-year-old Mahadik is the second Commanding Officer (CO) to die in a terrorist encounter this year. Col Mahadik, who belonged to the 41 Rashtriya Rifles was chasing heavily-armed terrorists, who had infiltrated across the LoC. Can China say that Pakistan is the victim? "Douce France, doux pays de mon enfance…” (Sweet France, Sweet Country of my childhood). My parents’ generation adored these lyrics of the famous French crooner Charles Trenet; indeed, the country of France must have been sweet in the early 1950s. Today things are different; very different. On Saturday night, Paris witnessed the worst terror attack in France's history: some 129 people were killed and more than 350 injured. In his televised intervention, President Hollande said, "Terrorist attacks of an unprecedented level are underway across the Paris region. It's a horror." He was referring to the attack in the Bataclan, a popular concert hall in Paris. It was packed with 1,000 people for a concert by the US band Eagles of Death Metal. One hour into the concert, some Black-clad gunmen walked from the back of the hall and started calmly, methodically firing at hundreds of screaming concert-goers. A radio presenter who was present first thought it was part of the show, “but we quickly understood. They were just firing into the crowd." It soon turned into ‘a bloodbath’, another witness later said. One attacker told the crowd, "It's the fault of Hollande, it's the fault of your president; he should not have intervened in Syria." It was the first time that France experienced suicide-bombers: 7 of the 8 terrorists identified so far died after activating their suicide-vests. The temporary tally is horrific: 1 casualties near the Stade de France, 5 dead rue de la Fontaine au Roi; 12 dead rue Bichat ; one terrorist killed on boulevard Voltaire; 19 persons died rue de Charonne and more than 90 in Bataclan. Already 11 months ago, two brothers, Saïd and Chérif Kouachi entered the offices of the French satirical weekly newspaper Charlie Hebdo in Paris. Armed with assault rifles, they killed 11 people and injured 11 others. They identified themselves as members of the Yemeni branch of Al-Qaeda. While leaving, they shot dead a Police officer posted outside the building. Later in the day, other attacks took place in the Île-de-France region, five more were killed and 11 wounded. The public in France thought that it would not happen again, but it did. The difference this time was that the attacks did not occur in any symbolic place, but in ‘normal’ popular areas such as restaurants, concert hall …and the Stade de France, which for many symbolizes of the multiracial character of French sport. 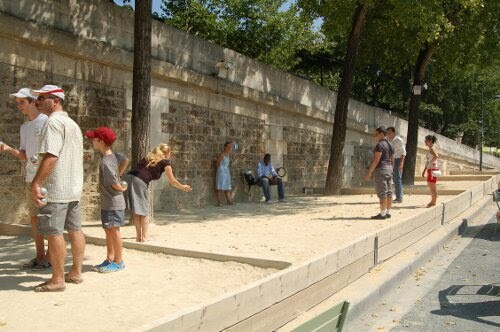 Why did this happen in France? A personal experience immediately came to my mind. It was 5 years ago. I was a bit spaced out after the long journey from Chennai as I arrived at Charles de Gaulle airport in Paris. A man approached me (like outside most airports in India) and asked: “Can I help you, my taxi is just there; I will drop you wherever you want”. Though in India, I only deal with ‘prepaid’ taxis, there in my country of birth, I was fooled. The man then called ‘his brother-driver’, and when I explained that my relatives’ resided near the Stade de France, he said “no problem, in 10 minutes you will be there”. He braggingly added: “I know how to avoid the ‘bouchons’ (‘cork’ meaning traffic jams’)”. As soon as I was in the taxi, I had a strange feeling: was it really a good idea? I soon discovered that my ‘pal’ had no knowledge whatsoever of Paris and its suburbs; he missed the correct turn off the freeway. “No problem, I will take the next one out”, he confidently said. For more than one and half hours, we visited different banlieues (suburbs). I was getting more and more nervous to have jumped into this so-called ‘cheap and friendly taxi’. To cut a very long and meandering story short, I forced the driver to leave me “at any Gare-RER” (Metro-station). As I waited for my relatives to pick me up, two vans of CRS (the well-equipped riot police who deal with difficult suburbs) arrived. I was going to have a most enriching ‘journalistic’ experience. Immediately, a CRS advised me not to go far on my own; it was a ‘difficult’ area, he said. While on the pavement with the CRS, youngsters kept passing by, passing comments on the police, who remained ‘cool’ and refused the provocation. The CRS requested me again me to stay with them, it was better not to wander around with my big suitcase; for a long time, I watched them handling all sorts of youths, often aggressive or drugged. My general feeling was that the youngsters were completely lost and out to provoke. The fact remains that if even one out 1 lakh is ‘converted’ to jihad, it becomes a huge problem for the State. Molenbeek, Brussels’ banlieue where at least 3 of the terrorists, who died in Paris, lived, probably faces a similar situation. In 2006, President Sarkozy had triggered a hot debate: how can France tighten its security? He had proposed that anti-social elements who had recently acquired French nationality be stripped of their citizenship, if they committed crimes against police personnel. Many asked how a nation which invented the mantra of “Liberty, Equality, Fraternity” and was the first of speak of the equality of all citizens in front of the law, could speak of a double-tier law (one for ‘true’ French, one for new ones). Obviously, the solution could not be so simplistic. Since my 2010 experience, the situation has further deteriorated, not only in France, but in nearby Belgium where some of Saturday’s attackers lived and also elsewhere in Europe. Issues are further aggravated by the fact that Douce France is not doing too well economically. Three days before the latest Paris events, Bernard Cazeneuve, the French Home Minister had announced that a terrorist attack had been thwarted in Toulon, the naval base in Southern France, where the aircraft-carrier Charles de Gaulle is based. On October 29, Hakim, a 25-year old resident of the city, had been arrested for preparing a terrorist attack targeting some French naval personnel. Hakim’s whereabouts were being monitored since some time by the Direction General for Internal Security (DGSI), the branch of the French intelligence responsible for anti-terrorism. Hakim had recently come into contact with 21 year-old Mustapha Mokeddem, one of the IS recruiters also living in Toulon. A usual scenario followed: Hakim met Mustapha, who convinced him to join the jihad, but Hakim failed to leave for Syria in October and December 2014. Two months later, Hakim was banned to leave French territory and his passport confiscated. Then, encouraged by Mustapha Mokeddem, he decided to ‘act in France’. When he received two parcels containing some assault weapons and hoods, the police arrested him. He told the French police that since a few months, the IS propaganda had ordered the new recruits that if they were unable to join the ‘Caliphate’, they should prepare attacks in France. In one video, a IS cadre exhorts his ‘brothers’ to become ‘solitary wolves’ and to fight the ‘infidels’: “Kill them with knives, spit in their face as much as you can” were his injunctions. For the French intelligence, the difficulty is that many ‘normal’ youth can one day come across a recruiter or a preacher who ‘converts’ them to jihad. There is no easy solution to stop this. And more worrying is the large amount of arms and ammunition used by the terrorists on Saturday. All this raises critical questions, including the French foreign policy, the question of migrants and the inadequacy of the intelligence sharing within Europe. Will the France and European leadership be able to take adequate decisions? Only the future will tell us, but certain aspects of today’s France definitely lack ‘sweetness’. My article It’s a horror! appeared in The Asian Age and The Deccan Chronicle today. Can Old Europe continue with the present policy towards migrants? What is the future of the Schengen Agreement? Will we see a return to a Europe with borders? 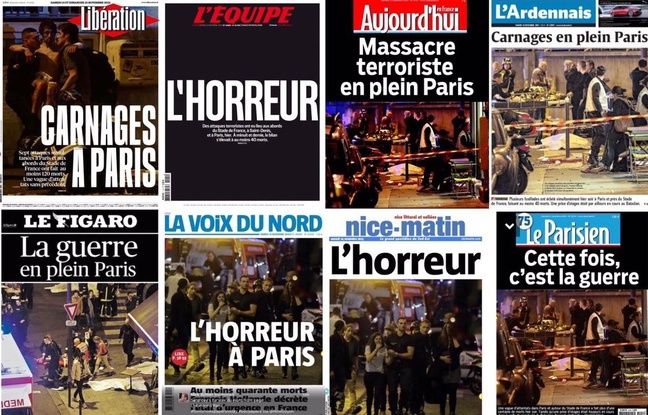 "Terrorist Massacre in Paris”, “The Horror”, “Carnage in Paris”, “The War in the Centre of Paris” — On Saturday morning I woke up to these headlines in the French press when all I wanted to know was the result of the football match played in the Stade de France in Paris between France and Germany. Usually, this match resembles a Test match between Pakistan and India, the brother-enemies thrashing out their differences on the field. This time, however, it was more than a “friendly” match — during the first half of the game, many in the stadium heard three loud explosions. It was only when the match was over that the spectators got a fuller picture and realised that four people had died in the proximity of the stadium, three out four casualties were suicide bombers themselves. French President Francois Hollande, present in the stadium, had to be immediately escorted away to attend an emergency Council of Ministers meeting and to address the nation. While the spectators in the stadium were still dispersing in a relatively calm atmosphere, Mr Hollande announced a state of emergency over the entire territory of France. During the following two hours, at least five more venues, in different areas of Paris, were struck. Everyone still carried in their mind the morning of January when two brothers, Saïd and Chérif Kouachi, entered the offices of the French satirical weekly newspaper Charlie Hebdo in Paris. Armed with assault rifles, they killed 12 people and injured 11 others. They identified themselves as members of the Yemeni branch of Al Qaeda. While leaving, they shot a police officer posted outside the building. A while later, several other attacks took place in the Île-de-France region. Five more were killed and 11 wounded. Two days later, the brothers were shot dead by police commandos outside a factory in Dammartin-en-Goële in Paris’ suburbs. This was hardly 11 months ago.This time some 130 people have been killed and more than 200 injured — the worst terror attack in France’s history. He was referring to the attack in the Bataclan, a popular concert hall in Paris. It was packed with 1,500 people for a concert by the US band Eagles of Death Metal. One hour into the concert, four gunmen in all black walked onto the stage and calmly and methodically started firing at the concertgoers. A radio presenter who was present first thought it was part of the show, “but we quickly understood. They were just firing into the crowd.” It soon turned into “a bloodbath”, another witness later said. According to the latest reports, the four assailants were later killed when the riots police stormed the Bataclan, “three by activating their suicide vests and a fourth shot dead”. The tally is horrific: Four casualties near the Stade de France, five dead at rue de la Fontaine au Roi; 12 dead at rue Bichat; one terrorist killed on boulevard Voltaire; 19 persons died at rue de Charonne and more than 80 in Bataclan. To understand what happened, it is important to look at an event that occurred three days earlier. Bernard Cazeneuve, the French home minister, announced that a terrorist attack had been thwarted in Toulon, the naval base in southern France. Toulon hosts important naval installations and is also where the aircraft carrier Charles de Gaulle is based.On October 29, Hakim, a 25-year-old resident of the city, was arrested and charge-sheeted for planning a terrorist attack on some French naval personnel. Since the summer of 2014, Hakim was being monitored by the Directorate-General for Internal Security (DGSI), the branch of the French police responsible for anti-terrorist fight. They had got wind of Hakim’s plan to leave for Syria to fight on the side of the Islamic State of Iraq and Syria (ISIS). A few months earlier, he had been noticed by the DGSI sleuths after he had posted violent jihadist messages on Facebook. Hebdo for publishing cartoons of Prophet Mohammad. A usual scenario followed: Hakim met Mokeddem who convinced him to join the “jihad”, but Hakim failed to leave for Syria in October and December 2014. Two months later, Hakim was banned from leaving the French territory and his passport confiscated. Then, encouraged by Mokeddem, he decided to “act in France”. When he received two parcels containing some assault weapons and hoods, the police arrested him. Apparently, his target was some of the 12,000 personnel working for the French arsenal in Toulon. He told the French police that since a few months the ISIS had been telling new recruits that if they are unable to join the “Caliphate”, they should prepare attacks in France. In one video, Salim Benghalem, an ISIS member, was seen exhorting his “brothers” to become “solitary wolves” and to fight the “infidels”. “Kill them with knives, spit in their face as much as you can,” were his injunctions. The attacks in Paris seem to have been coordinated with a new level of sophistication, without the DGSI and other intelligence agencies getting wind of it. What is particularly worrying is the large amount of arms and ammunition used by the terrorists. This raises serious questions for Old Europe: Can it continue with the present policy towards migrants? What is the future of the Schengen Agreement, which provides free circulation for people and goods within the area? Will we see a return to a Europe with borders? That would be very sad indeed.Even when the state of emergency is lifted, these questions will probably have not found answers. In India, a lot has been said recently about “intolerance”, but on November 13, France experienced “intolerance” with its blood (like India did in 2006). Year 2015 will indeed remain a dark year for France. China has found a new definition for ‘corruption’. In an article posted on the website of the Central Commission for Discipline Inspection (CCDI), responsible for the anti-corruption campaign, Chen Quanguo, Tibet’s Party Secretary, made a strange declaration. It is true that very few heads have rolled in Tibet so far; only Le Dake, the head of the Tibetan Autonomous Region’s (TAR) dreaded Security Department, responsible of collecting ‘hostile foreign intelligence’ in Tibet and in India, has been demoted (Le Dake’s name had appeared in 2008 as the official responsible for a military/security cell to watch over Tibetans in order to ‘save’ the Olympic Games from hostile Western attacks). 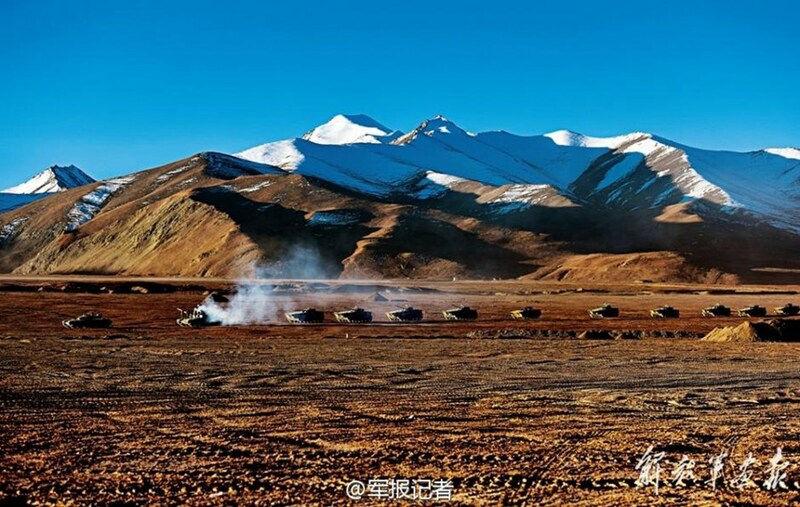 Already in April, the State Council (China’s Cabinet) released a White Paper about Tibet’s development path. It was not the first WP published by the Chinese Government on the subject; in fact, it was the 13th since the State Council first attempted to justify its position about ‘ownership and human rights’ in September 1992. The main characteristic of this last avatar was a violent attack against the Dalai Lama. One could ask, why assail the Tibetan leader at a time when many in China realise that the Buddhist monk is the best bet if Beijing is seriously trying to find a solution to the Tibetan issue. Beijing was mistaken about the tides’ direction: democracy, freedom of thought and speech are accepted concepts everywhere on the planet, except in the Middle Kingdom which seems to have passed into reverse gear under Xi Jinping’s leadership. The White Paper requested the Dalai Lama to ‘put aside his illusions’ about Tibet’s future status. 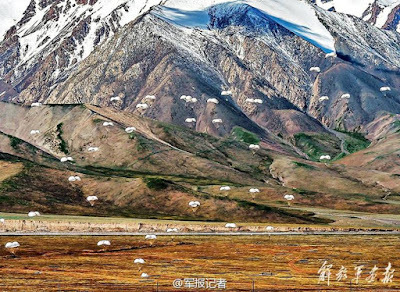 The timing of the publication was linked to the celebration of the 50th anniversary of the establishment of the Tibet Autonomous Region. In 1965, Tibet was divided into five areas, about one third becoming the TAR, while other parts of historic Tibet were officially integrated in the Chinese provinces of Yunnan, Sichuan, Gansu and Qinghai; divide and rule at its best. Today, the irony is that Beijing still insists that it will nominate the next Dalai Lama; the Communist Party seems absolutely unable to see how illogical its stand is. Poor Karl Marx must turn in his tomb! 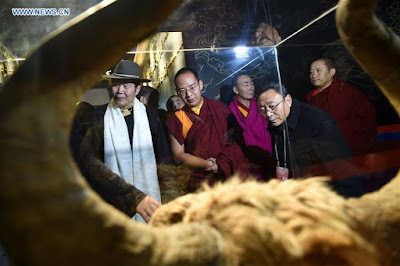 In March, as China's 12th National People's Congress (NPC) opened with the usual fanfare at the Great Hall of the People in Beijing, Padma Choling, the TAR’s Chairman, had already created a flutter by declaring: “it's not up to the Dalai Lama to decide [about his own reincarnation].” The Tibetan official was objecting to the Dalai Lama’s earlier announcement saying that ‘[his] traditional religious role should cease with his death’. 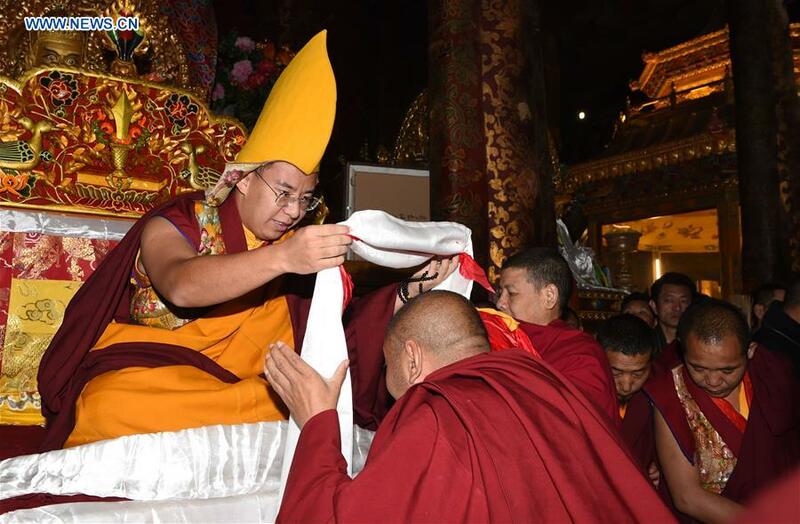 He added that the process: “should follow strict historical conventions and required religious rituals of the Tibetan Buddhism …and be approved by the central government,” in other words the Party. Can you believe that according to Beijing, it is for the Communist Party of China to decide who will be the next Dalai Lama; it is the ‘tradition’, they affirm! How will the Communist Party choose the next Dalai Lama? 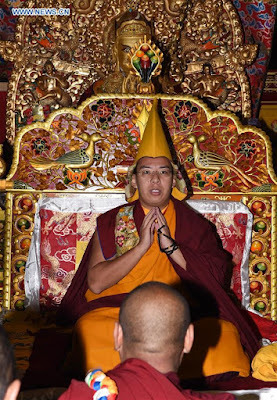 Probably like Gyaltsen Norbu, the current Panchen Lama anointed by the Party, by falsifying the dies thrown out a Golden Urn (incidentally, the rite had not been used for the previous 2 Dalai Lamas). This raises a serious question: while efforts are being made to have a more ‘normal’ relationship over the Strait, the relations over the Himalayas are getting tenser. Why can’t President Xi meet the Dalai Lama on ‘neutral’ ground and shake the monk’s hand for a few seconds? 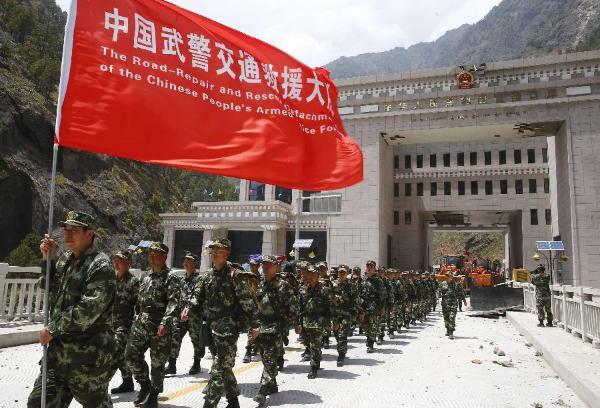 After all it is also in China’s interests to sort out the Tibetan issue; further, there is a serious human tragedy behind the 65-year old ‘liberation’ of Tibet. This human aspect should be tackled first. I can give the personal example of a close Tibetan friend of mine. 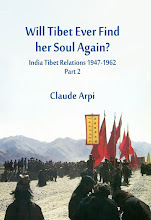 As a small child, soon after her mother passed away, she was brought to India while her father stayed behind in Tibet; she went to Dharamsala in order to receive a good Tibetan education. That was 38 years ago. In 2004, with other members of her family living in India, she had the opportunity to meet her father again, …for 4 hours after her father was literally smuggled into a remote monastery near the border between Nepal and Tibet. Recently my friend’s father became critically ill; she was unable to speak to him, the communications between India and Tibet being cut. Her father passed away a few days ago, but she could not even phone her family left in Tibet; and, of course, no question of attending the funeral. She eventually got some news through a relative in Nepal, who was able to contact the family on the other side of the Himalayas. 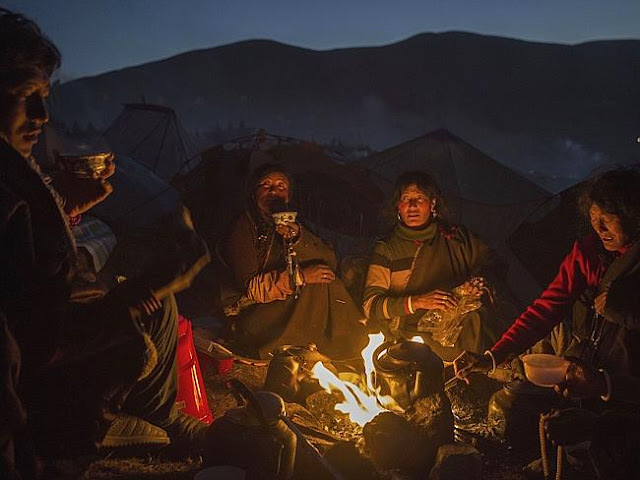 With Party officials like Mr. Chen who considers that any Tibetan official having a contact with their relatives in India is ‘corrupt’, the inhuman situation facing the Tibetans inside and outside Tibet is bound to deteriorate further. Why can’t the Modi government take the initiative of bringing some humanity into the fate of the Tibetans? If North Koreans can meet South Koreans at designated places, why can’t India and China agree on a few places along the borders where relatives could meet from time to time? It seems a small thing, but it would be a great step forward, a human step. A meeting between Xi and the Dalai Lama could help making a breakthrough in this direction. In fact, it would be a great victory for China which dreams to become ‘normal’. 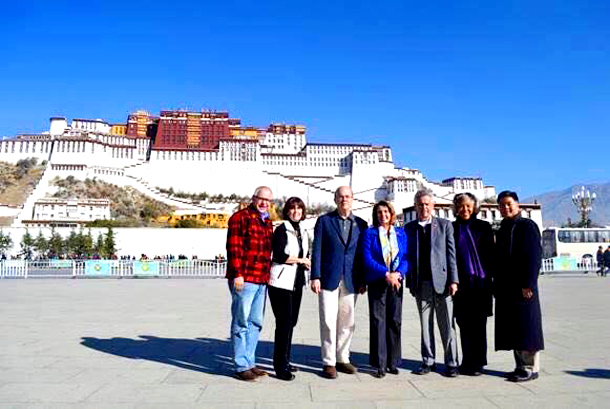 Nancy Pelosi, the US House of Representatives Minority Leader took the opportunity of a visit to China (which included a meeting with officials of China’s National People’s Congress), to visit Tibet with a US delegation. When she was asked about her Tibet trip during a meeting with Zhang Ping, a vice-chairman of the Chinese parliament, her response was not clear. Zhang queried: "Madame Pelosi you have been to Tibet. I was concerned about your health. I can see there is nothing wrong with your health. This shows your health is very good. I want to first hear your impressions of your visit to Tibet." Pelosi just answered that she had shared some of her views on Tibet during an earlier meeting, but she made no other comments about her present visit, which had not officially been scheduled. The main focus of her present visit to Beijing was boosting Sino-US trade ties a well as exchanges with her Chinese interlocutors on cyber security, climate change and human rights. During a news conference Hong Lei, a Foreign Ministry spokesman, confirmed that Ms. Pelosi and her delegation had gone to Tibet before traveling to Beijing, but he did not give any detail about the Tibet trip. 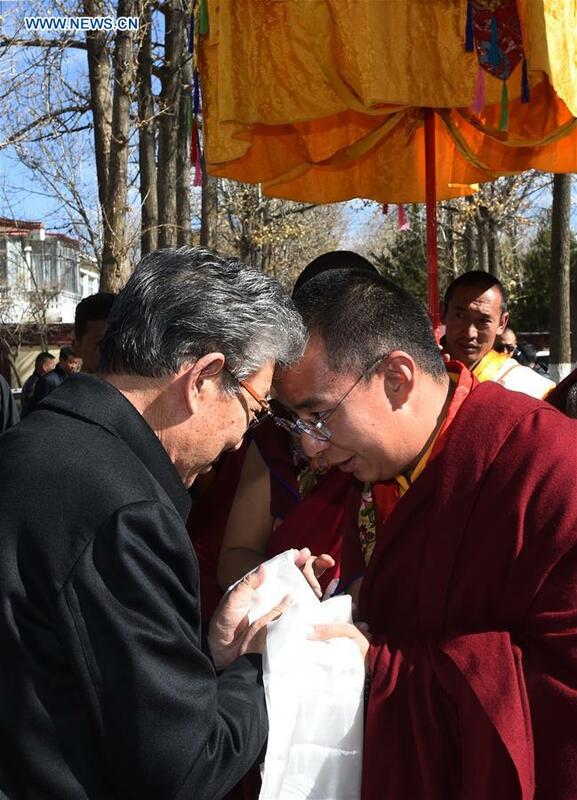 Knowing her interest for Tibet, she would have been logical that she meets with Jampa Phuntsok, one of the senior most Tibet cadres and also a NPC’s vice-chairman (like Zhang Ping), but the Chinese authorities did not see it that way. In Lhasa, she met with nearly the entire Standing Committee of the Tibetan Autonomous Region’s (TAR) Regional Congress led by Chen Quanguo, the Party Secretary and Pema Choling, Chairman of the local People's Congress as well as Lobsang Gyaltsen, Chairman of the TAR government and Deng Xiaogang, Deputy Secretary of the Region. She was accompanied from Beijing by an old US-hand, Chen Guomin presently deputy secretary general of the NPC Standing Committee, who earlier served as Minister in the Chinese Embassy in Washington DC. Chen Guomin is an old acquaintance; he had already accompanied Pelosi during her 2009 visit to China. 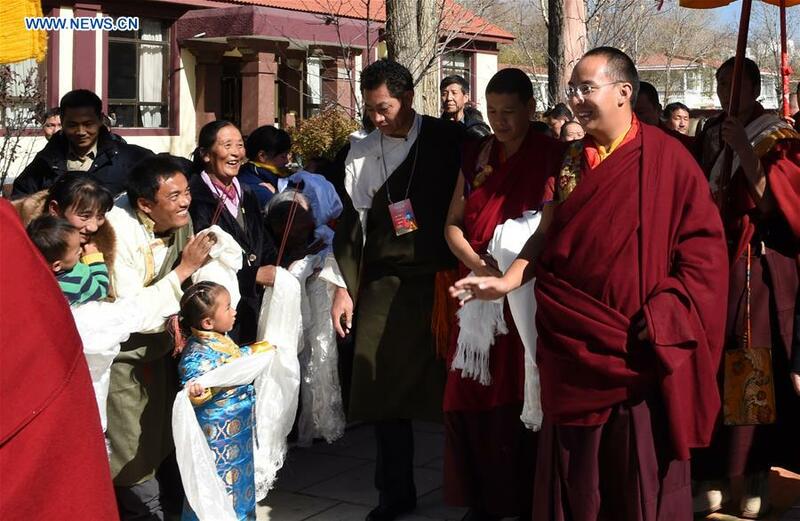 In Lhasa, Pelosi had time to visit the monasteries of Drepung, Ganden, Sera and Ramoche and met with representatives of the monks and nuns, said The Tibet Daily. According to the same official publication, Chen Quanguo briefly introduced Tibet's social and economic development to his American guest. Then Chen recited the usual banalities. He said that since ancient times Tibet is an inalienable part of Chinese territory; he mentioned Tibet's peaceful liberation 60 years ago, under the strong leadership of the Communist Party of China. He added that since then Tibetan people are their own masters. Tibet progressed in just a few decades more than in thousand years; this has brought earth-shaking changes to the region, especially since the 18th National Congress of the Communist Party of China [in November 2012], under the strong leadership of the General Secretary of the CPC Central Committee, Comrade Xi Jinping and the selfless support of the people [of China]. The Party Secretary told Pelosi: “The Fifth Plenary Session of the Communist Party of China's 18th Congress [held in October], has prepared a beautiful blueprint [for the future]. The Sixth Work Forum on Tibet [held in September] has pointed out the right direction; it has provided great support for the Tibetan people for a better future. Chen said that he sincerely hopes that Ms. Nancy Pelosi through her visit will further deepen her understanding of Tibet, with truth as an objective and that after her visit the prosperous and harmonious socialist new Tibet will be made known to the American public and the people of the world. This is of course, the Chinese version of the situation in Tibet. The reality is different, very different. The visit will probably not change anything on the ground. It is a pity that Nancy Pelosi could not meet any of the two Panchen Lamas recognized by the Dalai Lama (Gedhun Choekyi Nyima) and Beijing (Gyaltsen Norbu). It would have made her trip more educative. Today, I am posting a very rare document, the translation of a letter sent by the Dalai Lama to the Prime Minister of India on March 26, 1959. At first, it was my intention to halt at Lhuntse Dzong, not far from the Indian border, where I would repudiate the Seventeen-point 'Agreement', re-establish my Government as the rightful administration of all Tibet, and try to open negotiations with the Chinese. However, on about the fifth day [after he left Lhasa], we were overtaken by a posse of horsemen who brought terrible news. Just over forty-eight hours after my departure [on March 19, 1959], the Chinese had begun to shell the Norbulingka and to machine-gun the defenceless crowd, which was still in place. My worst fears had come true. I realised that it would be impossible to negotiate with people who behaved in this cruel and criminal fashion. There was nothing for it now but for us to get as far away as possible, though India still lay many days' journey distant, with several more high mountain passes in between. When eventually we reached Lhuntse Dzong, after more than a week's travel, we paused for only two nights, just long enough for me formally to repudiate the Seventeen-Point 'Agreement' and to announce the formation of my own Government, the only legally constituted authority in the land. Over a thousand people attended the ceremony of consecration. 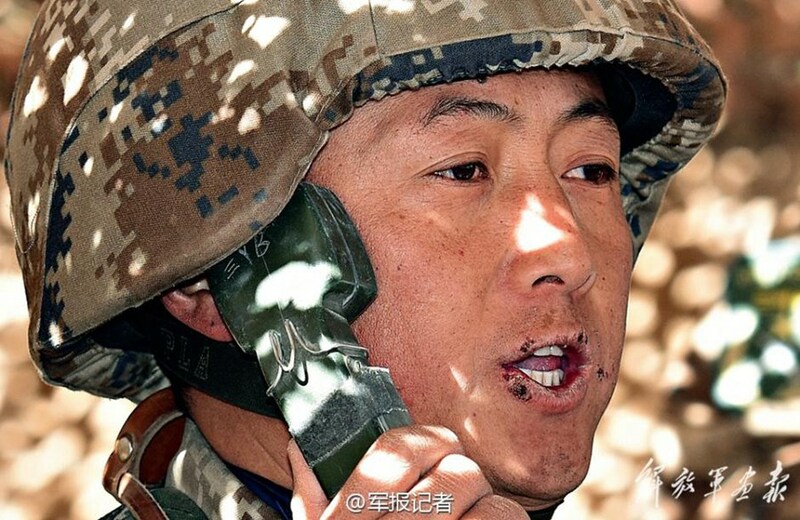 I wanted very much to stay longer, but reports informed us that there were Chinese troop movements not far away. So reluctantly we prepared to move on to the Indian border, which now lay just sixty miles away in a straight line, though actually about double that on the ground. There was still another range of mountains to cross and it would take several more days to cover the distance, especially as our ponies were already worn out and there was very little fodder to give them. They would need frequent halts to conserve their energy. Before we left, I sent on a small party of the fittest men, who were to reach India as quickly as possible, find the nearest officials and warn them that I was planning to seek asylum there. For some unknown reasons, the Dalai Lama does not mention the letter that he had sent to Nehru on March 26 from Lhuntse Dzong. On the 27th March, 1959, Shri T.S. Murty, Assistant Political Officer, Tawang, received instructions about the possibility of the Dalai Lama seeking entry into India. He reached Chuthangmu to receive the party at 09:00 hours on the 31st March, 1959. At 14:00 hours on the 31st March, the Dalai Lama and his party reached Kenze Mane [Khenzimane] which demarcates the frontier in Chuthangmu area. His Holiness was riding a yak and was received by the Assistant Political Officer, Tawang [Murty]. They proceeded to the checkpost without halting at the frontier. I take this opportunity to inform my readers that I have posted a large series of historical documents related to the arrival of the Dalai Lama in India in March/April, on my website. The institute is a branch of China North Industries Group Corp, China's main manufacturer of land weapons. The announcement probably addresses the Indian paramilitary personnel guarding the LAC in Ladakh and the McMahon Line in Arunachal. It will also help China to keep a watch on the Tibetans wanting to take refuge in India via Nepal. 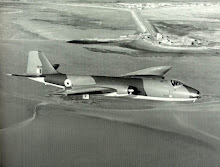 He added that the same system, equipped with sea-scanning radar can also be used for guarding the coasts of China. 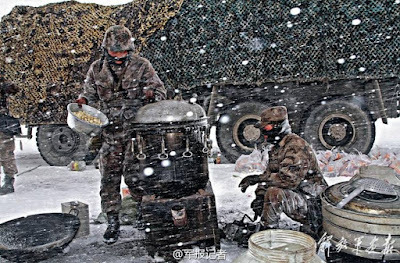 Border defense units in Xinjiang, Guangdong and Heilongjiang have for several years been using frontier monitoring systems, such closed-circuit televisions which had very limited detection capabilities. As the Ladakh/Aksai Chin border comes under of the Xinjiang Military District of Lanzhou Military Area Command, it probably means that the new system will be used (or is already used) on the Line of Actual Control (LAC). 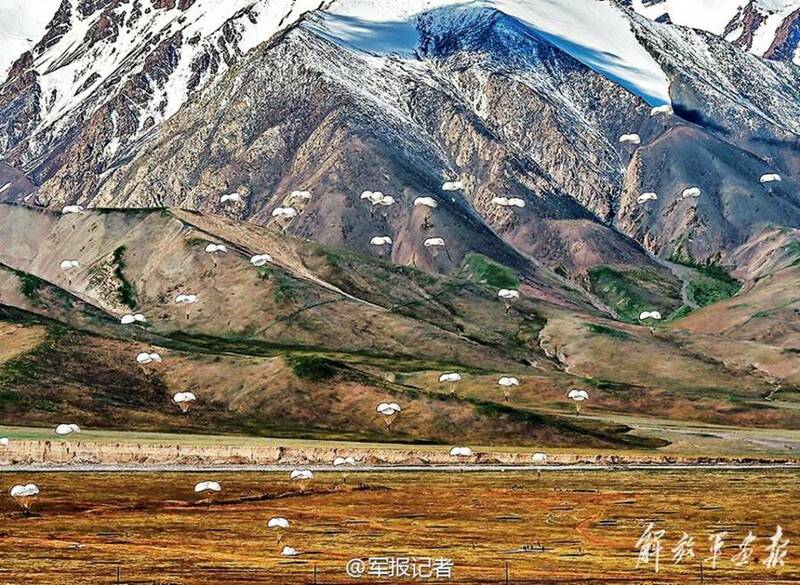 In the meantime, India always far behind, is trying to strengthen its borders with China, particularly in Ladakh. The Indo-Tibetan Border Police (ITBP) would like to deploy some additional 6,000 personnel along the LAC. 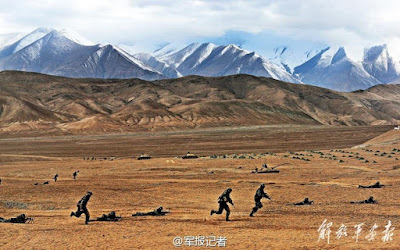 Today, the ITBP Force is responsible for the 3,488 km border with China from Ladakh to Arunachal Pradesh. A government source said that the ITBP has moved a proposal for deployment of six battalions to plug the gaps along the LAC. While the Indian side ‘moves proposals’, the Chinese acts. The question is: why can’t the ‘sensitive’ border be guarded by the Indian Army? Further why should an ITBP jawan spends 20 per cent on guard duties of VVIPs? Why can't other forces provide security for the VVIPs? ITBP does not have its own integral intelligence setup so essential in an operational situation. The Army has a comprehensive intelligence setup and has wherewithal for intelligence gathering and substantial surveillance resources. ITBP communications are based, primarily, on High Frequency radio, which is most vulnerable to interception and being jammed when required particularly in an operational situation. The Army has a secure radio and static line communication network with adequate redundancies built-in for exercising optimal operational command and control. Inter-communication between Army and ITBP is adhoc and is mainly provided from Army resources. ITBP’s integral radio equipment is incompatible with equipment currently in use by the Army. Given the nature of the high altitude of the region there is frequent movement of such personnel making the whole exercise temporary and fragmented. 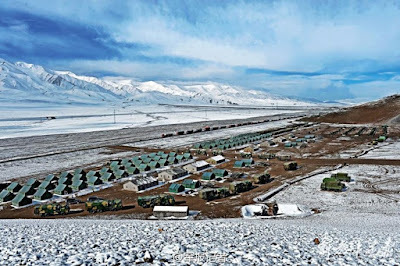 The Chinese Border Defence Units deployed and garrisoned along the entire LAC are directly under the PLA, which is surely not mere ‘policing’ duties. 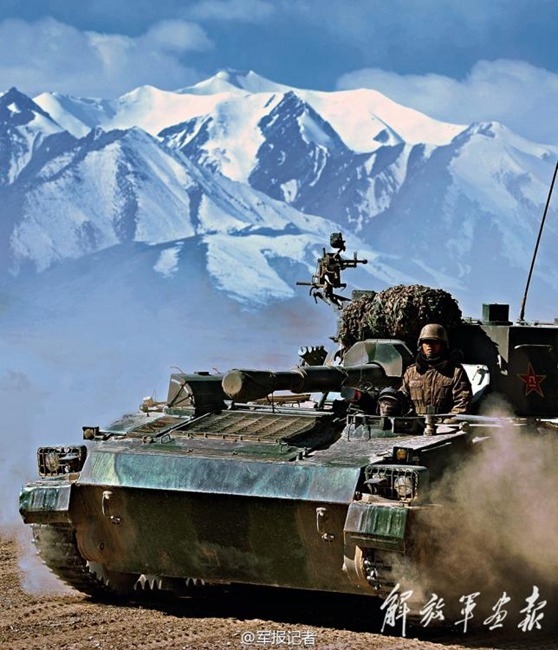 With a Police force deployed on the LAC, the Chinese will interpret it as a tacit acceptance of the Indian Government that the LAC is not a ‘LIVE’ border that needs to be guarded by military forces. A benign approach to the whole India-China Boundary question. This may not change soon. New cameras for the ITBP? After writing the above post, I came across an article in The Daily Excelsior, the largest newspaper published in J&K. It says: "Though peace prevailed between Sino-Indian troops along the LAC in Ladakh sector with both Armies holding regular interactions at Border Meeting Points (BMPs), India has decided to go ahead with installation of latest gadgetry along the LAC to monitor movement of the Chinese troops from its side." The Ministries of Home Affairs and Defence suddenly realized the "failure of previous such system to work up to the expectations of Army and ITBP, which guards the LAC along the China border." 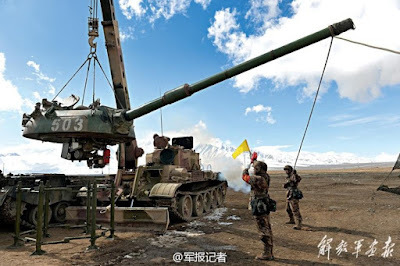 According to the The Excelsior "the MHA and MoD have decided to go ahead with their proposal for installation of high resolution sophisticated cameras to keep surveillance on the PLA activities on its own side." 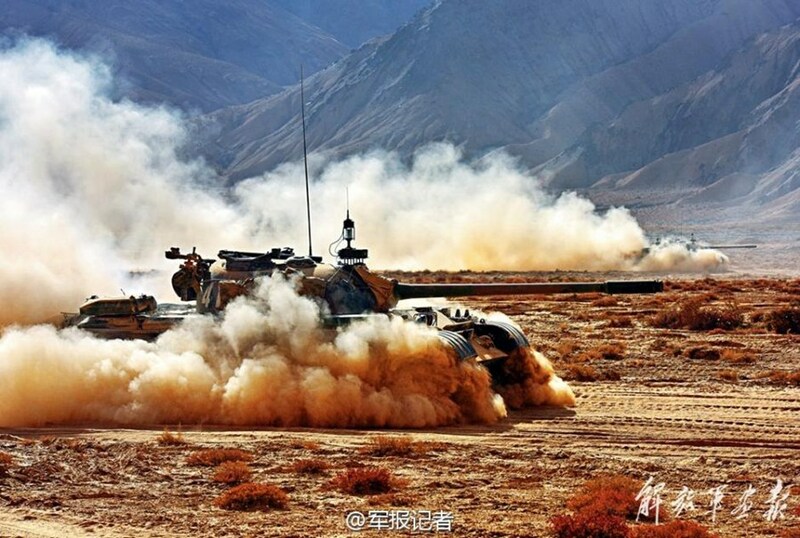 The Excelsior adds: "It was in this context especially after Despang incursions that the ITBP had decided to install sophisticated cameras to monitor movement of the PLA on the Indian side. However, this system has not worked and, therefore, the MHA and MoD have decided to go ahead with the new system of installing very high resolution surveillance cameras to ensure that they give adequate picture of the LAC, where the troops and the ITBP personnel can’t monitor or patrol regularly." 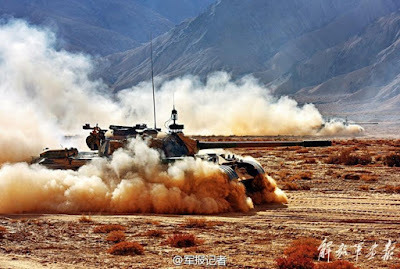 The fact remains that China is still several stages in front especially with the new drones and the newly-installed sophisticated equipments reported in The China Daily. The Chinese are ready for any eventuality. 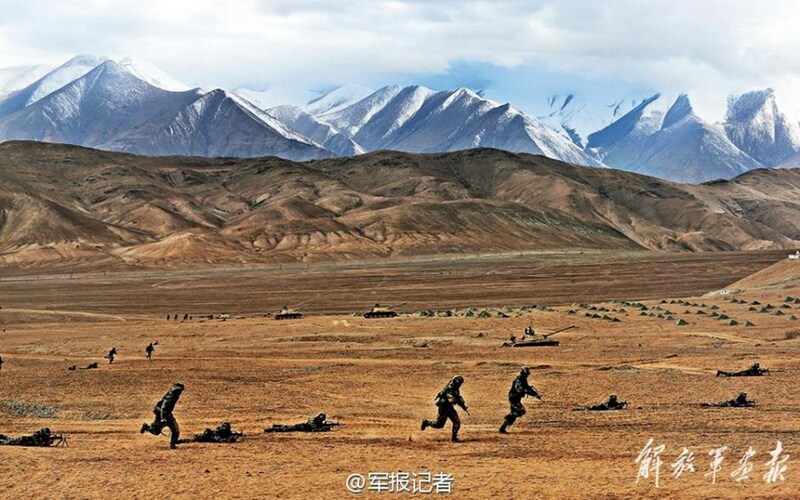 Have a look at these pictures of the Chinese border forces (PLA) exercising in the Kunlun Mountains, probably not far from Ladakh. My article India loses its Nepal monopoly as China gets set to become country's main commodities supplier appeared in Mail Today. It was unthinkable a few years ago, but it has happened. A day earlier, the tankers belonging to the Nepal Oil Corporation (NOC) crossed the newly-opened border post between Nepal and China at Rasuwagadhi. Though the NOC tankers had a capacity of 12,000 liter, they only collected 9000 liters petrol each, due to the poor road condition. In a way, the number of tankers was irrelevant: China just wanted to break India’s monopoly of oil supply to Nepal and publicize it. For Nepal, it was a historic first; for India, it will remain for a long time, something to ponder, as it marks the end of a special relationship with Nepal which lasted (with ups and downs) for centuries. Will the Indian diplomacy have a look at what went wrong? Introspection is usually not South Block’s forte. There is no doubt that the opening of Kyirong (Chinese: Gyirong or Jilong) land port between Tibet (China) and Nepal can provide a tremendous boost to Nepal's all-important economic relations with its giant northern neighbour. The earthquake in April this year (with its epicenter in Kyirong) delayed the port’s operations, but it is now functional. Even after trucks had been stranded at the India-Nepal border for several weeks forcing fuel rationing across Nepal, observers were incredulous. Can China supply oil to Nepal? But on October 26, Sushil Bhattarai, NOC’s deputy managing director confirmed to Agence France Press (AFP) that China had agreed to offer ‘as a grant’, 1.3 million litres of petrol. A few weeks earlier, the Nepalese Ambassador to India Deep Kumar Upadhyay had given a hint of what was coming, he had asked India not to ‘push it to the wall’ by blocking petroleum and other essential supplies, otherwise the landlocked country would have to find alternatives …‘despite logistical difficulties’. Even if the constitutional issues are resolved to the satisfaction of all (and not only a section of the Nepalese population), China is already the clear winner. Bhandari told Xinhua that Nepal should learn from the dedication of the Chinese government and its commitment towards the development of Tibet. This is of course propaganda, but the fact remains that Nepal and China are getting closer by the day, at a time when the relations between Kathmandu and Delhi are frosty. Nepal is also eying at the waves of tourists invading Tibet (17 million are expected in 2015). Kathmandu calculates that it would greatly benefit if only 10 percent of the Chinese tourists to Tibet could be diverted to Nepal. Out of the 8 lakhs of foreign tourists visiting Nepal every year, already nearly half are Chinese. Reverting the trend will not be an easy task for Delhi. 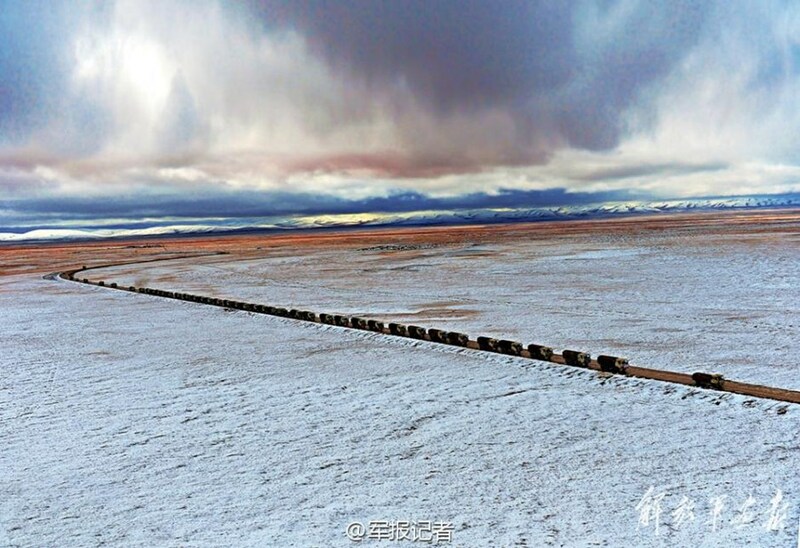 But perhaps even more dramatic for India, by the end of the decade the train will reach Kyirong. 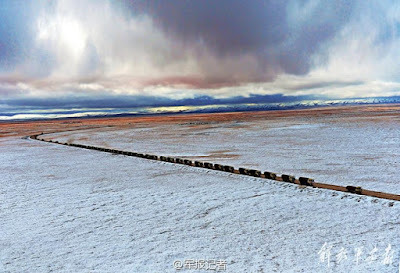 Beijing has planned the construction of a railway line connecting Shigatse with Kyirong county and Nepal’s border during the 13th Five-Year Plan (2016-2020). Then, not only Chinese tourists, but also commodities, including oil, food products, etc will flow into Nepal. In the long-term, it signifies that China will replace India as the main supplier of commodities; it will have serious political consequences. Has India already lost the battle? The problem is that Delhi often thinks ‘after’; it is not the case with Beijing.